"Hamlet has the kind of power, energy and excitement that movies can truly exploit," actor/director Kenneth Branagh says. In this first full-text film of William Shakespeare's play – shot on 65mm film and exhibited in Panavision Super 70, power surges through every scene. The timeless tale of murder, corruption and revenge is reset in a lavish 19th-century world, using sprawling Blenheim Palace as Elsinore and staging much of the action in mirrored, gold-filled interiors. A landmark cast (Julie Christie, Kate Winslet, Billy Crystal, Robin Williams, Charlton Heston and more), the excitement of the Bard's words and an energetic filmmaking style lift the story from its often shadowy ambience to fully-lit pageantry and rage. $148.321 thousand on 3 screens. On IMDB, you’ll find 73 “exact title matches” for Shakespeare’s Hamlet. The first came out in 1900, so we’ve gotten almost exactly one filmed adaptation – either on TV or the big screen - every year and a half since then. With so many versions out there, I shouldn’t feel surprised by the timing of any of them. Nonetheless, I remember thinking “another one already?” when the 1996 Hamlet hit the screens. If you look at those 73 adaptations, the vast majority remain forgotten/obscure. 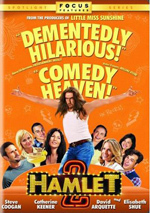 In the case of the 1996 Hamlet, though, it followed not far on the heels of another high-profile version. Franco Zeffirelli – noted for his 1968 adaptation of Romeo and Juliet directed a 1990 Hamlet that starred Mel Gibson. That flick didn’t become a huge financial success, but $20 million in 1990 dollars actually seems pretty good for Shakespeare. Even Baz Luhrman’s 1996 Romeo + Juliet - which seems to be the modern benchmark for “commercially successful Shakespeare” – only made $46 million, so I think the 1990 Hamlet did okay at the box office. With a prominent Hamlet on screens only six years earlier, why make another one so soon? I suspect that director/screenwriter/actor Kenneth Branagh felt compelled to make a theoretical definitive version. 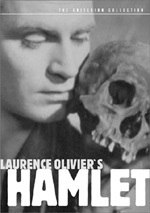 Unlike the 1990 Hamlet - and even Laurence Olivier’s Oscar-winning 1948 version - the 1996 film offered “Hamlet Uncut”. Those other flicks abridged the text, whereas Branagh gave us the whole thing, all four hours of it. Which clearly restricts the audience and sure didn’t help at the box office; Branagh’s Hamlet received a limited release in the US and only scared up about $4 million. Nonetheless, it spawned a good with Shakespeare fans and became the second Hamlet to hit Blu-ray; a 2009 adaptation beat it out by three months. I’m not sure Hamlet requires a plot synopsis, but here comes one anyway. Barely two months after the death of the Danish king, Queen Gertrude (Julie Christie) remarries – and she weds Claudius (Derek Jacobi), the king’s brother. This doesn’t sit well with Prince Hamlet (Branagh), and apparently the dead king isn’t too happy either, for his ghost (Brian Blessed) stalks the land. The ghost initially appears to some of Hamlet’s confidantes, but eventually the prince sees it as well. It claims that Claudius murdered him so he could ascend to the throne. This news sets Hamlet on a mission to avenge his father’s death. 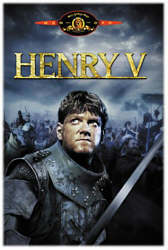 Back in 1989, Branagh did a lot to make Shakespeare “more accessible to the masses” via his adaptation of Henry V. His 1996 Hamlet almost felt like a step in the other direction. Sure, he gave the movie an open look and a vivid visual impression, but he must’ve been keenly aware that the general public wouldn’t flock to a four-hour version of Hamlet. Shakespeare’s always a tough draw; even with Mel Gibson near his box office peak, the 1990 edition couldn’t pull in many moviegoers. And that one tried very hard to be accessible, whereas a four-hour Hamlet seemed almost consciously aimed at alienating the mass public. The big question that revolves around this particular presentation of Hamlet becomes: does the audience gain much by exposure to the “full text”? In theory, yes, but I must say that the long version often threatens to turn into too much of a good thing. I was half-tempted to simply cut and paste my review of Henry V, as it came with nearly identical weaknesses, but Hamlet doesn’t enjoy the same strengths. It becomes less accessible than Henry simply because it’s a denser topic. When I watched Henry, I found myself a bit lost in the language but the movie’s action orientation helped relieve a lot of those problems. Branagh could rely on juicy battles to give the audience a spell from the language. Which doesn’t occur in the much chattier Hamlet. Of course, I don’t intend to criticize Shakespeare’s dialogue, which is consistently clever and poetic. But while I fully recognize the brilliance of the text, it’s still tough for modern ears to comprehend. Henry ran more than 100 minutes shorter than Hamlet and included a number of scenes that didn’t rely on dialogue, so it became more accessible. On the other hand, Hamlet is nearly all dialogue, so the audience never gets a respite. So with much of the same dialogue on display, why was it so much tougher for me to stick with Branagh’s Hamlet? I don’t know, though I suspect Olivier simply adaptation simply worked harder to make the material accessible. The performances probably helped, as I must admit I wasn't especially wild about some of the actors in the Branagh version. Starting with Ken himself. I thought he was fairly good in Henry, but he tended toward the BIG performance style that leads some to mock Shakespeare. If you hope to see a more subdued Branagh in Hamlet, expect disappointment. Indeed, Branagh may offer the most manic take on Hamlet ever committed to film. Branagh plays the part ala Daffy Duck; he’s so wired that I half-expected him to go “woo woo woo!! !” and literally bounce around the screen. The other actors fare better, though again, the performances tend to be big. Not as big as Branagh, of course, but still rather theatrical and exaggerated. I think some of that is inevitable for Shakespeare, as the language itself tends to be florid and not truly like common speech, but it’d still be nice to see the actors tone it down a bit. I’m also not wild about the film’s “stunt casting”, as Branagh uses a number of unlikely big names here. Jack Lemmon is a dud as Marcellus; while he was a fine actor, he doesn’t match with Shakespeare at all. Robin Williams also seems too campy and fey in his small part. To my surprise, however, I think Billy Crystal does quite well as a gravedigger. He actually plays Shakespeare in a fairly natural manner, and his lines emerge with ease; he manages to make them almost seem like regular language, and he doesn’t ham up the part. I’m not a Crystal fan, but he works here. In the end, I find Hamlet to be stylish but unsatisfying. It looks great, and I certainly admire its ambition, but the production itself never really engages the viewer. Hamlet appears in an aspect ratio of approximately 2.20:1 on this Blu-Ray Disc. Taken from the 65mm source, the transfer usually looked pretty terrific. Virtually no concerns with sharpness emerged. Perhaps I noticed the slightest hint of softness in a few wide shots, but the vast majority of the presentation came across as concise and detailed – very detailed at times, in fact, as the large-format negative yielded a strong sense of clarity. No signs of jaggies or moiré effects materialized, and I saw no artifacts or edge enhancement. Source flaws stayed minor; a few small specks emerged, but those were insignificant across the film’s four hours. For the most part, colors seemed lush and lavish. Skin tones could occasionally appeared a bit pinkish, but overall, the hues looked vivid and full. Blacks also came across as tight and deep, while shadows displayed fine clarity. The image’s minor concerns made this a “B+”, but I still felt quite pleased with it; I easily could’ve gone with “A”-level consideration. While not as impressive, the DTS-HD MA 5.1 soundtrack of Hamlet supported it reasonably well. A chatty tale, Hamlet didn’t leave a lot of room for a broad soundscape. Music used the various channels in fine fashion, but effects remained subdued. Shots of the ghost were the showiest in the film, as the ghost’s utterances echoed around the room. Otherwise, the surrounds – and even the front sides – just didn’t have much to do. This was the kind of film that mostly opted for mild ambience and little more. Audio quality satisfied. Speech was especially important, and the lines seemed natural and concise. Effects showed good clarity; on those rare occasions when they became prominent, they also displayed nice heft and power. Music was the best aspect of the track, as the score demonstrated fine range and dimensionality. Ultimately, this was a more than acceptable track, albeit one that failed to stand out as memorable. The disc’s extras open with an introduction by Kenneth Branagh. During this seven-minute, 50-second piece, the screenwriter/director/actor tells us why he decided to adapt Hamlet, aspects of the production, and thoughts about this Blu-ray. Most intros of this sort tend to be pretty useless, but Branagh actually gives us some good info and sets up the movie in a compelling manner. We get more from Branagh during an audio commentary he shares with Shakespeare scholar/film consultant Russell Jackson. Both sit together for this running, screen-specific chat. They discuss the story and the adaptation of Shakespeare’s “full text”, sets and locations, costumes, cinematography and production design, and a mix of other film-related topics. Though I usually criticize commentaries that suffer from dead air, I’d cut Branagh and Jackson a lot of slack if such gaps occurred here. After all, the guys sit for all four hours of the flick and need to fill the time with their thoughts; I’d totally understand if they sagged at times. Happily, they keep the energy high at all times and keep the material coming without any noticeable pauses. Not only that, but they make sure we learn a lot of good material throughout the conversation. Branagh and Jackson don’t simply yammer for four hours; they also ensure that they cover the film and the original text well. They throw out good interpretation of the story and characters, and they provide a nice assortment of production details as well. Though I feared a four-hour commentary would be a tough ride, Branagh and Jackson make this one enjoyable and informative. One questionable claim occurs, however. At one point, Branagh claims that the crew were enraptured because they worked on the same location where Ridley Scott shot parts of Gladiator. This doesn’t make sense; Gladiator came out about three and a half years after Hamlet, so it’s awfully illogical to think that Scott filmed portions of his epic before Branagh got there. 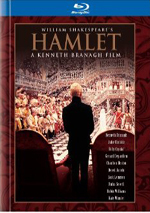 Created back in 1996, To Be On Camera: A History with Hamlet goes for 24 minutes, 34 seconds and features remarks from Branagh, Branagh’s double Orlando Seale, and actors Billy Crystal, Richard Attenborough, Kate Winslet, Jack Lemmon, John Gielgud, Derek Jacobi, Richard Briers, Michael Maloney, Robin Williams, Charlton Heston, Julie Christie, John Mills, and Rufus Sewell. “Camera” looks at the 1996 film’s production with comments about its development, cast and performances, sets, locations and costumes, and a few other tidbits. Based on its title, I hoped “Camera” would examine the many filmed versions of Hamlet from over the years. Nope – it just works hard to promote the 1996 flick. We see some good shots from the set and find a few minor bits of information, but overall, the show lacks much to make it worthwhile; it’s just publicity. In addition to the trailer for Hamlet, we get a Vintage Cannes Promo. It runs 12 minutes, seven seconds as it offers notes from Branagh. He throws out some general thoughts about the film, but much of the running time simply shows movie clips. It’s even more superficial – and less useful – than “Camera”; you can skip it and miss nothing. Finally, we locate a hardcover book. This comes as part of the package; open up the disc’s casing and the book appears on the left half. It features a mix of components. We get some essays about the production, cast biographies, trivia, ads and publicity photos. This provides a satisfying little addition. As much as I admire the ambition of this four-hour Hamlet, the end result does little for me. The movie suffers from some over the top performances – primarily our lead – and fails to become an accessible, engaging version of the tale. The Blu-ray boasts very good picture along with decent audio and supplements highlighted by an informative commentary. Shakespeare fans will want to give this a look, but they shouldn’t expect it to become their favorite version of the classic play.